You might be surprised at how much microbladers can make, especially if they do it right working from home. ​Microblading is perfect for women who want to add extra income to their already existing business, or simply add some extra money each month for a few hours of work each week. Microbladers right now make around $50 to $150 per hour. Generally the cost of microblading for clients ranges from $250 to $600 (with an average around $350 or so). When you consider that the microblading process takes about 4 hours start to finish you can divide up that cost minus an hard costs to get your hourly rate. The more experienced you are, the more techniques you know (shading, soft tap, ombre, etc.) the more you can charge and the higher your hourly rate. One of the best parts about microblading is changing women's lives (this is the part I love the most). Women will walk into your office self conscious about their brows​ and will be transformed within a matter of hours. It's not uncommon for my sweet clients to be so happy they cry when they see the finished result! Microblading will bring in on average an extra $2,000 to $4,000 per month depending on how much you work. If you charge the average price of $350 per client, then you only need 10 clients each month to bring in $3,500 every month. This is the perfect job for someone who wants to bring in extra spending money. If you want, you can always do more clients as well to make this a full time job. Microblading is taking off right now, so if you are thinking about it DON'T wait. Do I need a license to Microblade? To get started with microblading you do NOT need a license. Most microbladers are either cosmetologists or aesthetiticians. But I've trained other women who don't have any background in the cosmetic industry and they've done very well. The only thing you need to make sure you are comfortable with is cutting into people's skin. For some women this can be a big turn off, but for others it's not a problem. Another amazing benefit of microblading is that you can do it from your home! This means that you can add an extra income each month without taking a huge risk of renting out office space or signing a lease. Currently the majority of microbladers out there are practicing from their own homes. How do I get training for Microblading? One of the main benefits of microblading (at least for now) is that it does NOT require a license to get started. Most microbladers are/where existing cosmetologists or aesthiticians before they started microblading, but many women simply pick up the skill through practice and a comprehensive training program. Currently state laws do not regulate the use of Microblading, which means that you can start right away. But this also means that you NEED to get into a good microblading training course. ​You will want to find a comprehensive, hands on training program that will teach you how to be a proficient microblader by the time you have completed the program. ​If you live in Arizona you can find out more information about my microblading training program by clicking here. This 2 day hands on course is designed to take you from beginner to a practiting microblader in as little time as possible, and we are proud to say that our microbladers feel READY after training to start on their own. This is a big deal, because if you don't get the proper training you will end up having to spend more money doing extra training before you feel comfortable. ​If you have any questions about microblading or training please leave your comments below and I will get back to you as soon as possible. Once you decide to pursue your microblading career you will need to market your practice to get some clients! One of the best ways to get clients is through social medica, specifically instagram. ​Instagram is a visually oriented social media platform which works beautifully with microblading! It allows you to showcase your work and can really turn prospective clients into warm leads who want your work. In my training program I walk you through microblading marketing basics including how to set up your instagram and other platforms for success. 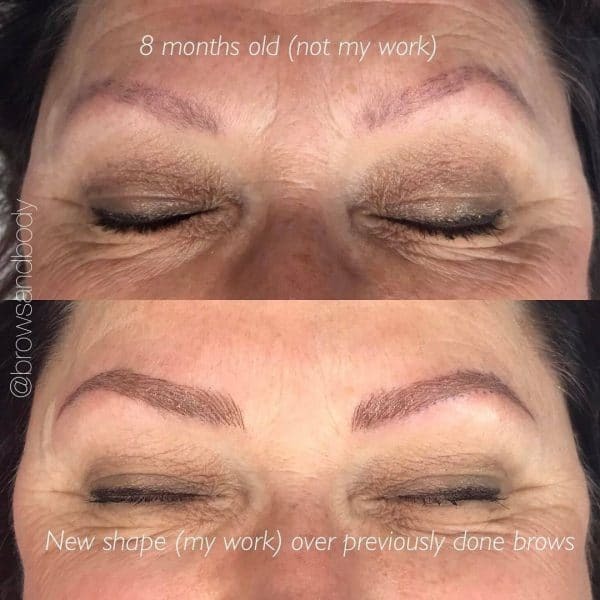 ​Microblading is an amazing career. You seriously get to transform people's brows right in front of them and they will love you for it. Are you interested in microblading?